DSL Cyber MoCA is a collective effort of DSL Collection of Contemporary Chinese Art and new media artist team Lily & Honglei, who intend to promote and develop highly interactive online exhibitions for contemporary art, particularly to present varied types of artworks in Cyber MoCA based on their “Land of Illusion” art project in Second Life. DSL Cyber MoCA is designed to create new art vocabulary by utilizing digital multimedia, online performances, virtual sculptures and traditional fine arts language. DSL Cyber MoCA also aims to contribute to artist community building with communication technology in the Internet age, to enhance global artist collaborations, to stress on audience/artist or artwork interactions, meanwhile emphasize education and cultural exchange functions. New Website: www.dslcollection.org DSL Collection has unveiled its newly designed website. The website has been re-organized to become more user-friendly while maintaining its allegiance to interactivity. New Audio E-book: www.dslebook.com DSL collection has worked with Chinese designers to create an audio e-book, an electronic interactive catalog of the DSL Collection. This e-book has been sent out to important curators, museums, art institutions, university deans, in China and all over the world. “Land of Illusion（太虚幻境)” has beendeveloped by Beijing artists Lily & Honglei (杨熙瑛, 李宏磊）since 2006. It is intended to make social and cultural commentaries about virtual worlds, particularly through reinterpreting themesin Chinese folklore. The work reflects on globalization’s impact on the environment and on the individual, which often results in multi-layered cultural or personal identity. It explores displacement and the spiritually homeless who struggle to preserve traditional values. More importantly, “Land of Illusion” is a virtual world art project that proposes solutions for preserving and re-evaluating cultural heritage with digital arts, and developing aesthetic traditions with new imaging techniques in the 21st century. 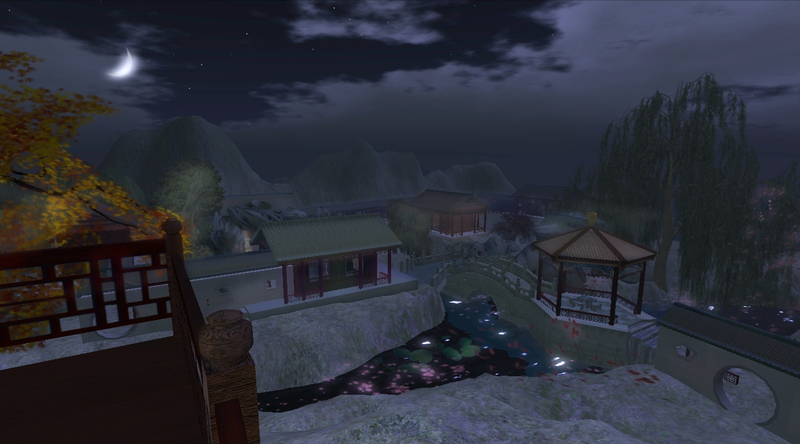 “Land of Illusion” is constructed in Second Life with virtual traditional Chinese architecture, where Lily & Honglei have created a series of virtual installations, multimedia presentations and online performances accomplished through cross-continent artist collaborations. It is a cultural meditation engaging history, philosophy as well as Chinese diaspora. The work examines the current economic development of China within the context of globalization, while simultaneously exploring the meaning of virtual online communities in terms of global dialogues as they relate to cultural roots and the fantasy of China. “Land of Illusion” also functions as a net-art platform aiming to fulfill the promise that the Internet is the direct continuation of Enlightenment thought, namely promoting cultural openness, decentralization and independent thinking. As Chinese contemporary artists, Lily & Honglei consider that these aspects are extremely relevant to art-making. From 2006 -2008, “Land of Illusion” received support from several art and cultural institutions. In 2009, “Land of Illusion” is funded by DSL Collection of contemporary Chinese art. Lily & Honglei are redesigning and developing the virtual constructions to DSL Cyber Museum of Contemporary Art. DSL Collection and the artist team Lily & Honglei share the ownership of DSL Cyber MoCA.